In Greece, Storm Brews Over Chinese-Run Labor Chinese shipping giant Cosco has locked in a $5 billion deal at the Greek port of Piraeus. For China, the pier is a strategic gateway for Chinese goods into Europe and beyond. But a former Cosco dockworker alleges mistreatment, and Greek officials have fined the company for labor violations. China has capitalized on the financial crisis to expand its influence in Europe, promising to buy Greek, Spanish and Portuguese bonds. But its most important infrastructure deal in Europe has been its investment in the Greek port of Piraeus. Through such deals, Chinese influence is changing more than just the financial landscape in Greece — with ramifications for the rest of Europe. Standing at the container terminal of the port of Piraeus, John Makrydimitris points toward his feet. "There is Greece," he says. Then he gestures toward a metal fence just yards away. "And there is China," he says with a laugh. For dockworkers like Makrydimitris, the other side of that fence certainly seems like another country. Piraeus is Greece's largest port, just six miles from Athens. 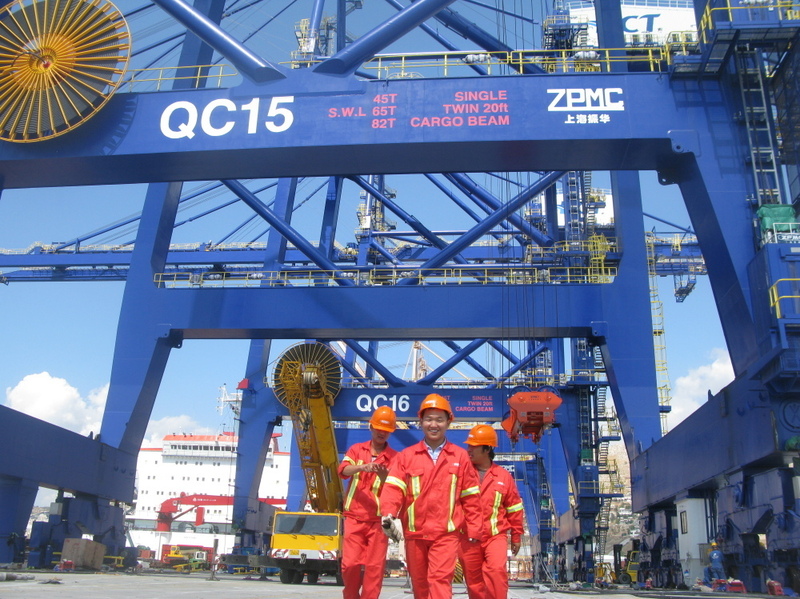 Last June, the Chinese shipping company China Ocean Shipping Co., or Cosco, took full control of its container terminals, leasing it for 35 years for almost $5 billion. Experts believe it's probably China's largest investment in Europe to date. For China, the pier is a strategic gateway to bring Chinese goods into Europe and beyond. "It's very important for the Chinese to enter through Piraeus to the eastern European and Black Sea markets, which are really booming right now," says Makrydimitris, as he gestures once more over the Chinese boundary line. Straddle carriers — 40-foot-tall mobile cranes that look a bit like sci-fi mechanical spiders — line up to transport the enormous container boxes, which workers lash in place with iron rods. For these workers, labor conditions on the Chinese side of the line are very different from those on the Greek side. Employees of China's state-run Cosco company work at the port in Greece on Sept. 13, 2010. The company is accused by Greek unionists and by employees of importing Chinese labor practices. Cosco doesn't allow unions or collective bargaining among its 500-plus Greek workers. The unions report that Cosco workers are largely unskilled and working on a temporary basis, with no benefits. Despite persistent rumors about their labor conditions, until now no Cosco workers have spoken out to the media. But a former Cosco worker, who had just been sacked, spoke to NPR about work conditions on the Chinese-run pier, on the condition that his name not be used. The worker says he regularly worked eight hours a day with no meal breaks and no toilet breaks. "I think their actions are breaking the law," the worker said. "The rights are to have something to eat around 12 o'clock [and] to have our breaks, and not work like a dog straight [through] from morning till afternoon." He says workers were told by supervisors to urinate into the sea, rather than taking toilet breaks. Those operating straddle carriers had to take cups up into their cabins to urinate into, and he says they were not given breaks, either, despite the clear dangers of operating at such a height for so long. The worker says he was paid 600 euros a month — about 50 euros each shift — around half the salary at the neighboring Greek-operated pier, with no extra money for working night shifts or weekends. There was no set schedule; he was kept on 24-hour call for nine months. His wife says the experience changed his personality. "In the end, it was like a nervous breakdown," she says, gazing at him with concern. "All day he was just waiting to see whether they would call. He didn't know if he had time to eat or to sleep. Sometimes they would ring in the night to tell him to go to work. It was like torture." NPR has gained access to official Greek documents that back up this account. Last August, in response to a parliamentary question, the local department of labor inspection for Piraeus said it had discovered one Cosco worker's schedule had changed 14 times in one month. 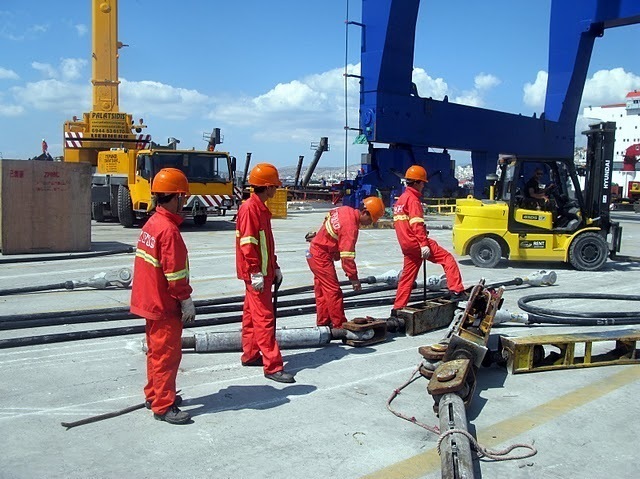 During two visits last year — in August and October — the labor inspection department noted four separate labor violations at Cosco's Piraeus pier. In August, the agency fined Cosco 3,000 euros after discovering dockworkers working on their rest days. In October, it found the same again, as well as discovering an untrained worker operating a lifting vehicle and a worker with no employment papers. The unions say there have been two accidents in one year involving straddle carriers, which they ascribe to a lack of proper training. The former Cosco worker described the situation as chaotic. Cosco took full control of the port of Piraeus, close to Athens, last June. This approximately $5 billion agreement is probably China's largest deal in Europe. "There is no organization — it's a complete mess," he says. "There's no training for specialized jobs. This is what happens in a third-world country." His contract, signed by a subcontractor, not by Cosco itself, says no money will be paid for overtime, unless there was a prior written agreement with the company. He says he accepted these conditions because there was no other work available. But when he demanded his overtime pay, he was fired. Cosco has turned down repeated requests for an interview, both in Greece and in Beijing. The Chinese Foreign Ministry and the Commerce Ministry also declined to be interviewed for this story. But speaking to a public forum, Cosco's flamboyant chairman, Wei Jiafu, has insisted that delivering benefits to his workers and easing unemployment are his top priorities in Greece. He also boasted about the fact that none of his Greek workers had ever been on strike. "By going global, we are also transferring our culture to the rest of the world," he told a gathering at the World Economic Forum in the Chinese city of Tianjin in September 2010. 'Importing The Chinese Labor Model'? But that is exactly what the dockworker unions in Piraeus had feared. In this port city, there had been some support among ordinary people for Cosco taking over the container terminal, in the hope that it would create new employment. But there was implacable opposition from the dockworkers union, which has not erased the anti-Chinese graffiti on the wall of the carpark beneath their headquarters. 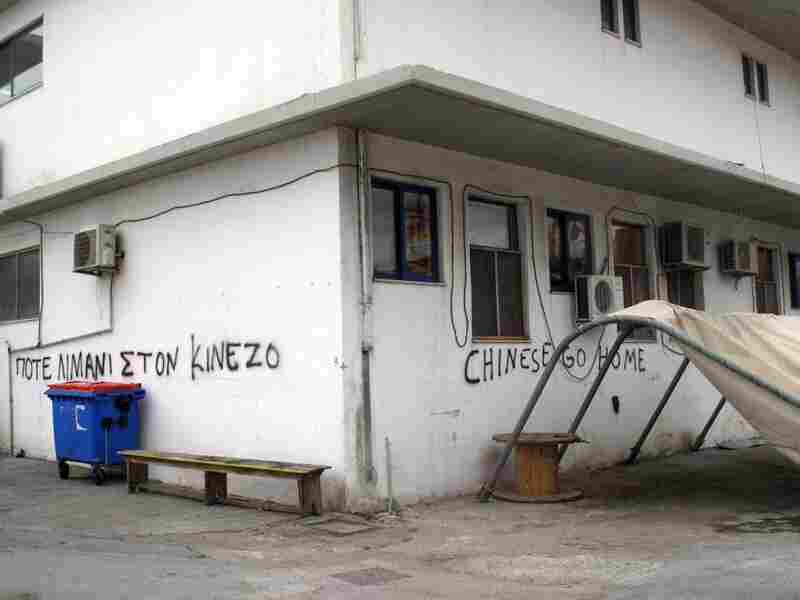 Graffiti at the smaller Greek pier at Piraeus says "Chinese go home." Greece's dockworkers unions were opposed to the Chinese involvement at Piraeus, although among the general public, the mood was more positive. They argue that Cosco has changed the rules of the game, with ramifications rippling throughout the sector and beyond. "What we do believe is that Cosco is importing the Chinese labor model to Greece," says Nick Georgiou, president of the dockworkers union. "The result is that companies not run by the Chinese are being influenced by what the Chinese are doing in lowering the labor costs and reducing workers' rights." Labor conditions aside, he has deep concerns about Cosco's behavior, which he describes as approximating blackmail. 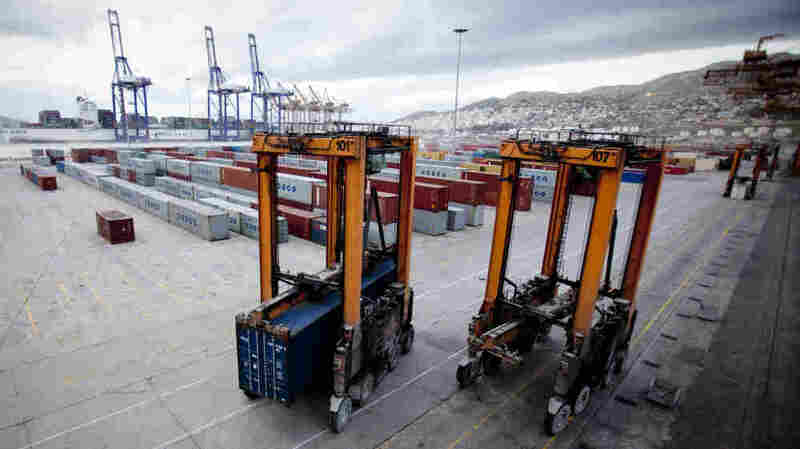 "What we see is that the Piraeus Port Authority is stopped from functioning properly because of obstacles that Cosco puts in its way," he says. He's referring to the fact that Cosco is preventing the port authority from signing an exclusive deal with another major shipping company, MSC, until next June — a move that is effectively limiting competition. Georgiou also believes Cosco is dangling the promise of future investment in a logistics hub in Thriasio as a negotiating tool to gain extra concessions in Piraeus. The Chinese company has recently announced it is delaying completion of a new third pier by five years to 2020, citing the financial crisis. Cosco is also demanding exemption from certain fees charged by the Piraeus Port Authority, saving it as much as $4 million a year, according to shipping sources. A Threat To Greece's 'Rule Of Law'? 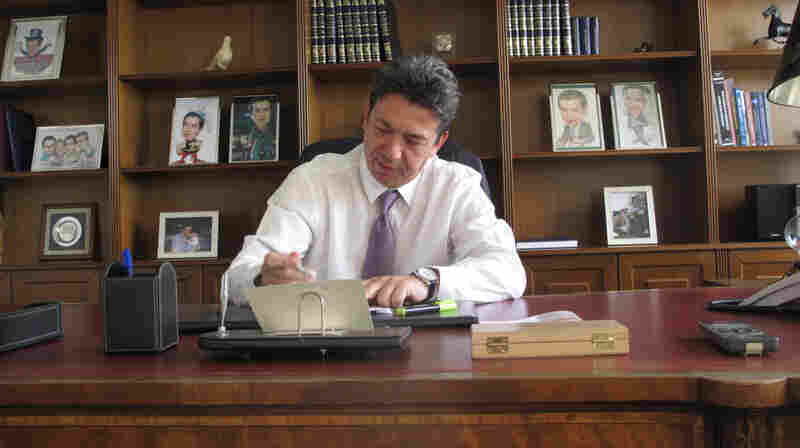 Yiorgos Anomeritis, the chairman of the Piraeus Port Authority, negotiates with Cosco. Speaking recently, he expressed sympathy for Cosco's desire to delay work on the pier to give it "time to recover" from the financial crisis. When asked how Greece is benefiting from the deal, his answer boils down to one thing: money. "The port authority is being paid for the pier that it has ceded to Cosco," he says. "That by itself is some kind of gain for Piraeus." But Cosco's critics see things very differently. "We spoke in Parliament about our fears that labor rights would worsen," says Piraeus representative Theodore Dritsas of the left-wing Syriza party. "But what has happened is beyond our imagination." He's been following the labor issues closely after complaints from within his constituency. Greek Minister of State Haris Pamboukis has called the Cosco deal "a model." He denies knowledge of any labor violations and says "the only kind of law applicable is Greek law." "The main problem is that Greece is no longer a sovereign state in economic terms," he says. Greek politicians are facing a race against time to solve the country's debt crisis. In its most recent plan, Greece has put $70 billion of its assets up for sale, including its entire holdings in the ports of Piraeus and Thessaloniki, another port in which Chinese companies had expressed an interest in the past. This could offer another opportunity for Cosco to consolidate its investment in Piraeus, at a cut price that could be as low as $500 million. Before this announcement was made, Minister of State Haris Pamboukis told NPR that the Greek cooperation with Cosco was a "model" to be followed. He denied all knowledge of any labor violations, shrugging this off as "rumors" by competitors. "The only kind of law applicable is Greek law, and we're not going to import any kind of practices — Chinese, Martian or elsewhere — who are not conforming to our legislation," he says. "We are in a country for rule of law, and that's it." "Piraeus is not a colony," Pamboukis says confidently. But these words may be too late. According to the Cosco worker's account — and the Greek government's own investigations — Cosco has already violated labor regulations in its shipping concession. The way China undercuts competitors has been called the "China price," and with Cosco's arrival, the China price has now hit Europe's docks, threatening no less than Europe's rule of law.